When first presented to execs it was the one that almost got away, Parker Brothers didn’t like it but the inventor went away, made some tweaks, went back and they lapped it up like the man from Del Monte. The property trading play has acquired cult status these past eight decades, there is a set in every house in the UK*, everyone above ten has played it* and it has been a bringer together of families with a high % of these gatherings ending badly*. This game brings out the worst in everyone, it is almost impossible not to try and cheat/find another player cheating during play. If you think contrary to the latter statement you’ve been hoodwinked/bamboozled – someone ALWAYS takes a tad of extra cash not due or pays too little into the bank, you know they do. 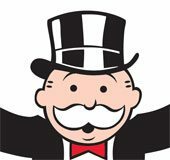 So, as the game celebrates its 80th bash (ahead of the March 19th actual birthdate), when Mr Monopoly finally takes off his top hat and reveals he has a mohican, Hasbro are rolling out the stunts. The French are kicking it off by putting real money inside just 80 boxes from a bunch of 30,000 across the classic, junior, electronic and vintage variants and ooh la la they’ve done rather well on the press coverage front. Why? Well it’s Monopoly. I think you could’ve garnered coverage if you’d announced that you were putting a real boot inside selected sets, bringing back the iron that was replaced by the danged cat you now find in the game. One set has a decent-enough-I-suppose 20,580 euros inside, ten sets have €300 and the other 69 sets just €150 – Austerity to the max? Oui Oui!